Pope Francis greets the crowd as he arrives for his general audience at St. Peter's Square at the Vatican on Wednesday, October 8. 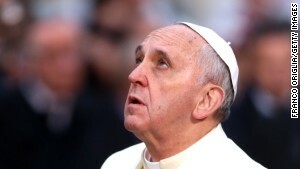 With his penchant for crowd-pleasing and spontaneous acts of compassion, the Pope has earned high praise from fellow Catholics and others since he replaced Pope Benedict XVI in March 2013. 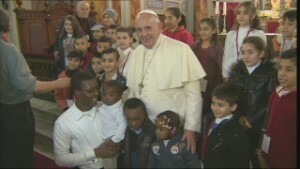 The Pope meets faithfuls as he visits the San Gregorio Parish in Rome on Sunday, April 6. 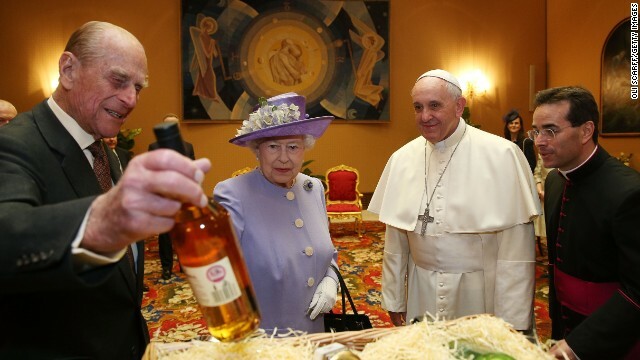 Queen Elizabeth II and Prince Philip, Duke of Edinburgh, have an audience with the Pope during their one-day visit to Rome on April 3. 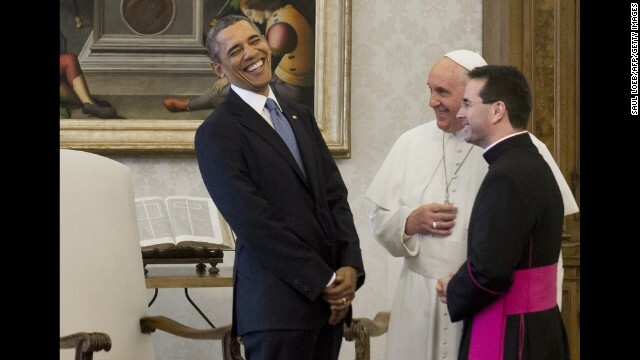 Francis speaks with U.S. President Barack Obama, who visited the Vatican on March 27. 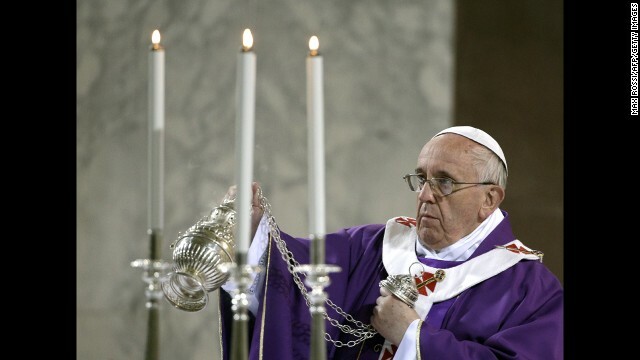 The Pope blesses the altar at Rome's Santa Sabina church as he celebrates Mass on March 5, Ash Wednesday. Daniele De Sanctis, a 19-month-old child dressed up as a pope, is handed to Francis as the pontiff is driven through the crowd February 26 at St. Peter's Square in the Vatican. 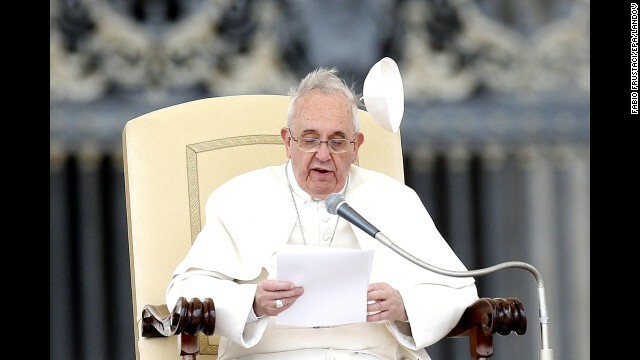 Wind blows the papal skullcap off Pope Francis' head February 19 in St. Peter's Square. A lamb is placed around Francis' neck as he visits a living nativity scene staged at the St. Alfonso Maria de' Liguori parish church, on the outskirts of Rome, on January 6. 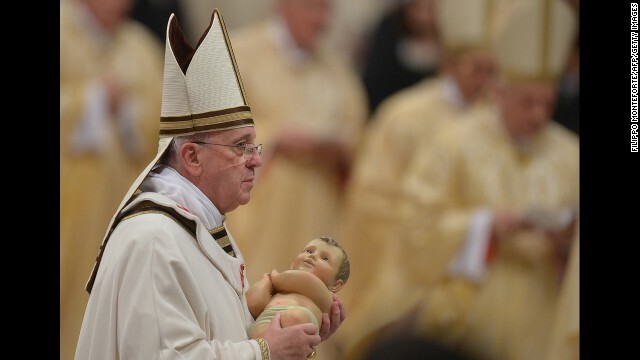 The Pope holds a baby Jesus during a Christmas Eve Mass held at St. Peter's Basilica in the Vatican in 2013. 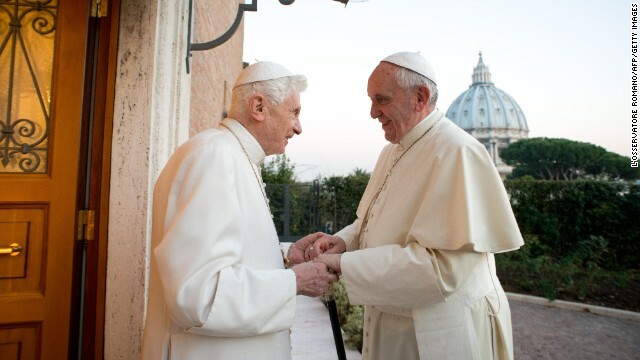 Pope Francis, right, meets with Pope Emeritus Benedict XVI at the Mater Ecclesiae monastery in the Vatican on December 23. Benedict surprised the world by resigning "because of advanced age." 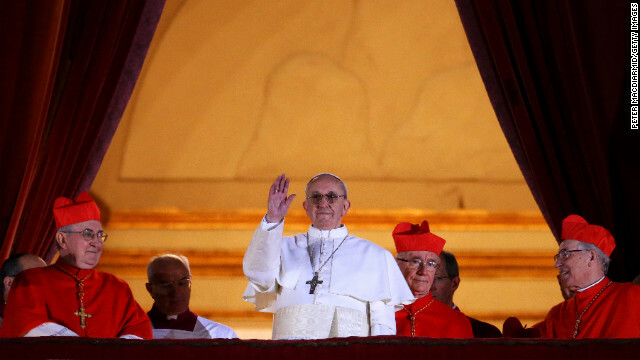 It was the first time a pope has stepped down in nearly 600 years. Pope Francis marked his 77th birthday on December 17 by hosting homeless men to a Mass and a meal at the Vatican. One of the men brought his dog. 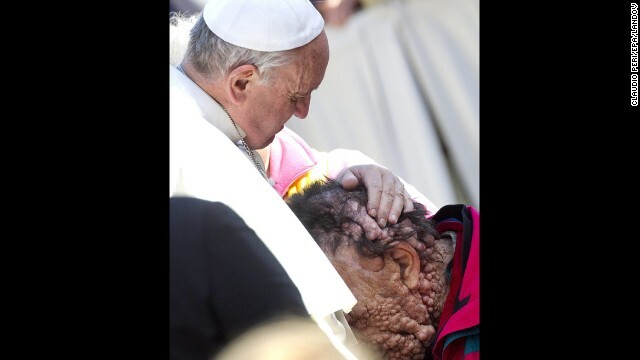 Pope Francis embraced Vinicio Riva, a disfigured man who suffers from a non-infectious genetic disease, during a public audience November 6 at the Vatican. Riva then buried his head in the Pope's chest. 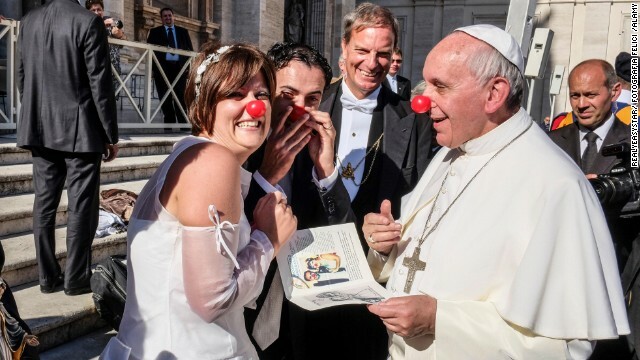 Pope Francis jokes November 6 with members of the Rainbow Association, which uses clown therapy in hospitals, nursing homes and orphanages. 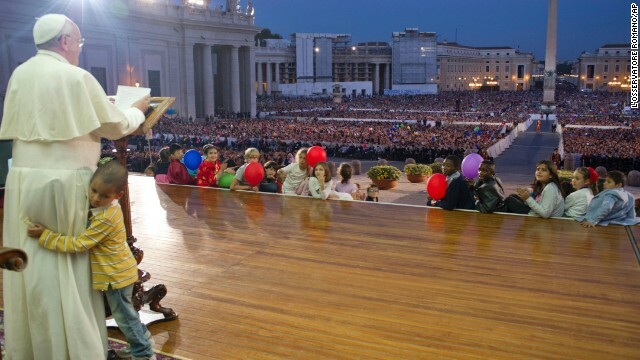 A young boy hugs Francis as he delivers a speech October 26 in St. Peter's Square. 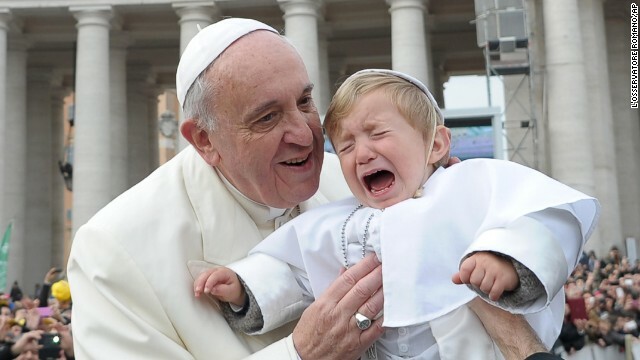 The boy, part of a group of children sitting around the stage, played around the Pope as the Pope continued his speech and occasionally patted the boy's head. Francis has eschewed fancy cars. 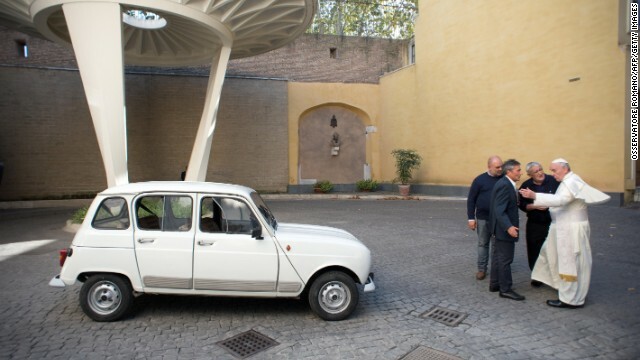 Here, Father Don Renzo Zocca, second from right, offers his white Renault 4L to the Pope during a meeting September 7 at the Vatican. 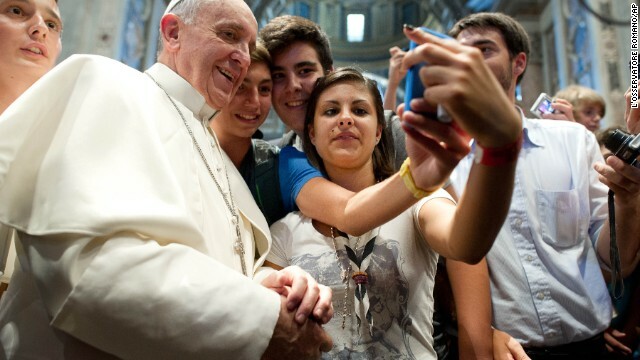 Francis has his picture taken inside St. Peter's Basilica with youths who came to Rome for a pilgrimage in August. 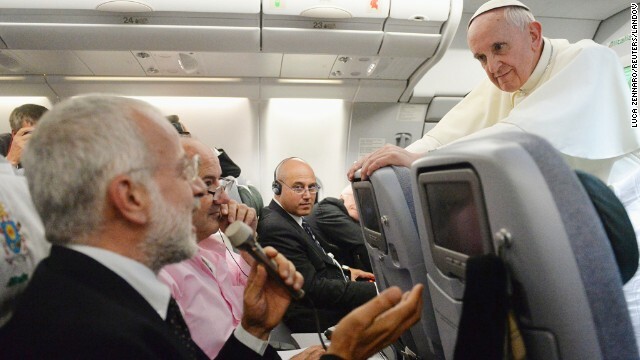 During an impromptu news conference on July 29, aboard a plane from Brazil to Rome, the Pope said about gay priests, "Who am I to judge?" Many saw the move as the opening of a more tolerant era in the Catholic Church. 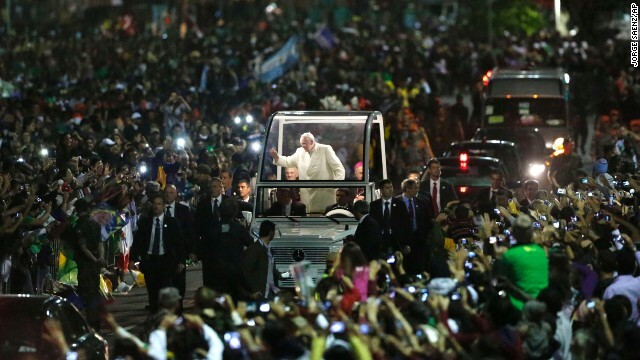 Crowds swarm the Pope as he makes his way through World Youth Day in Rio de Janeiro on July 27. 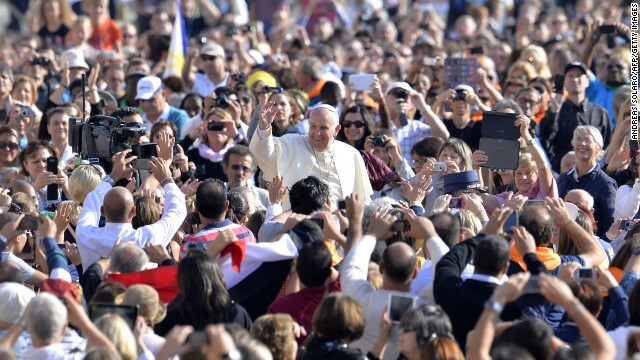 According to the Vatican, 1 million people turned out to see the Pope. 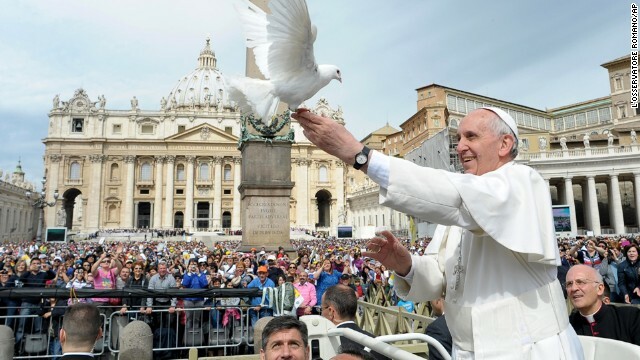 Francis frees a dove May 15 during his weekly general audience in St. Peter's Square. 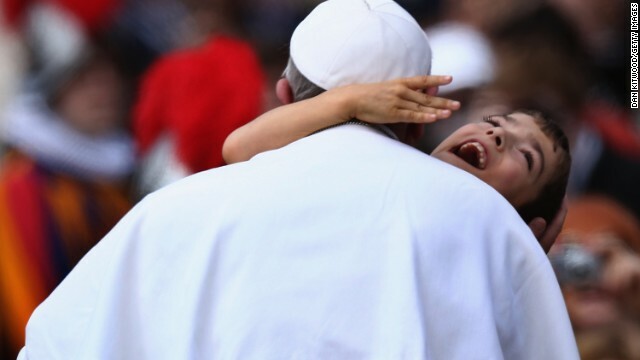 Francis embraces a young boy with cerebral palsy on March 31, 2013, a gesture that many took as a heartwarming token of his self-stated desire to "be close to the people." 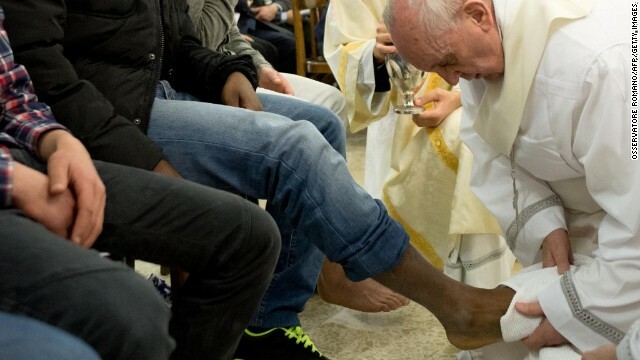 The Pope washes the feet of juvenile offenders, including Muslim women, as part of Holy Thursday rituals on March 28, 2013. The act commemorates Jesus' washing of the Apostles' feet during the Last Supper. Francis stands at the reception desk of the Domus Internationalis Paulus VI residence, where he paid the bill for his stay during the conclave that would elect him leader of the world's 1.2 billion Catholics. Francis, formerly known as Argentine Cardinal Jorge Mario Bergoglio, was elected the Roman Catholic Church's 266th Pope on March 13, 2013. The first pontiff from Latin America was also the first to take the name Francis. Story went viral because it fit pattern of pronouncements many expect of Pope Francis, she says. Editor's note: Heidi Schlumpf is a columnist for the National Catholic Reporter and teaches communication at Aurora University. The opinions expressed in this commentary are solely those of the author. 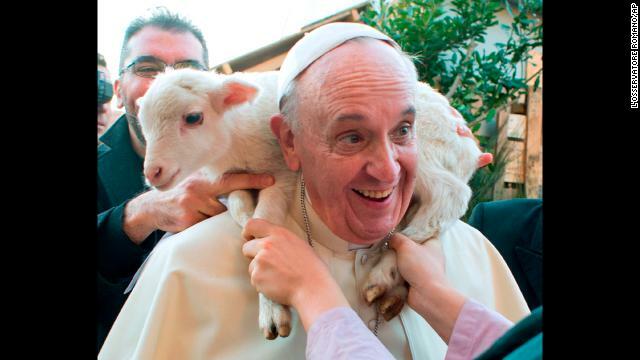 (CNN) -- A story about Pope Francis allegedly saying animals can go to heaven went viral late last week. The problem is that it wasn't true. Many erroneous news reports on this incident relied on an article that appeared in The New York Times. 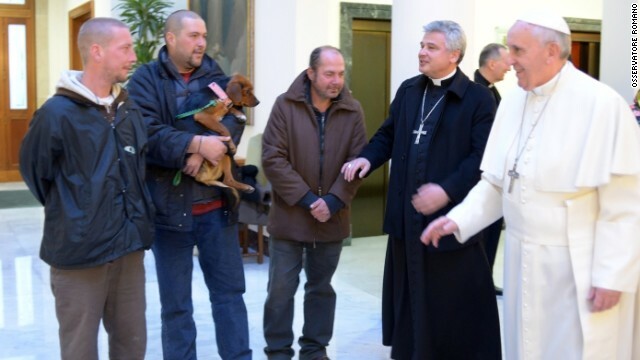 That article alleged that the Pope, at a general audience at the Vatican, comforted a boy whose dog had died by saying: "One day, we will see our animals again in the eternity of Christ. Paradise is open to all of God's creatures." So: Wrong and wrong again. But even the correction at the Times and elsewhere (including this news site) did little to stop the initial report of the story from zinging around the Internet and giving new, unfounded hope to animal lovers everywhere. First, while I know it's tempting to write punny headlines like "Dogs in heaven? Pope Francis leaves Pearly Gates open," news organizations that ran the erroneous account really should hold fact checking to a higher standard. Note to writers: Don't rely on People for the Ethical Treatment of Animals as a source for papal quotes. Second, part of the reason this story caught fire is that it sounds like something Pope Francis would say. In his two years as the leader of the worldwide Roman Catholic Church, Francis (who took the name of St. Francis, the church's patron saint of animals) has prioritized the lowly. By extension, he must love puppies and kitties, right? As David Gibson of Religion News Service points out, this isn't the first time such a myth about this Pope has spread. Last year, news reports said he was sneaking out of the Vatican at night to feed the homeless around Rome. A nice thought but also not true. 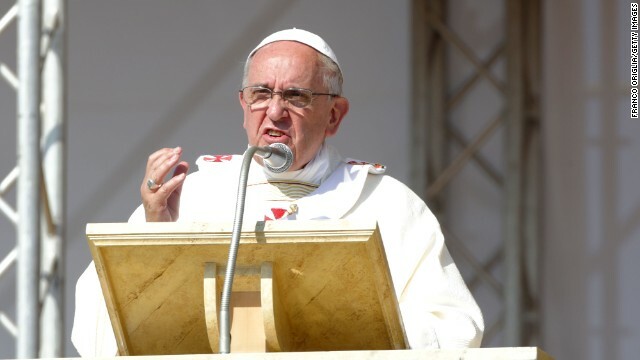 "The media and the public are so primed for Francis to say novel things and disregard staid customs that the story was too good to check out; it fit with the pattern," Gibson writes. The "animals can go to heaven" meme also paints Francis as a stirrer of theological controversy, which brings me to my third point: People have strong feelings about whether they will spend the afterlife with their deceased, beloved pets. This is where I should be honest and admit I'm not the world's biggest animal lover. A bite when I was a young child instilled a lasting fear of most dogs, especially big ones. But I have loved some animals, including my sister's dog, Buddy, who died earlier this year. Lots of friends tried to comfort her with the "rainbow bridge" story, which says that animals wait in a heaven-like place to be reunited with their owners in the hereafter. This is definitely not Catholic teaching, but its popularity reveals the desire of people to believe that their pets' lives have meaning. While the Catechism of the Catholic Church, which contains official church teaching, does not address the issue directly, it does make clear that animals do not have the same immortal souls of humans and thus would not be eligible to enter the Pearly Gates, so to speak. The catechism says we should not mistreat animals, but points out that God made them for humans' stewardship and that we should not "spend money on them that should as a priority go to the relief of human misery. One can love animals; one should not direct to them the affection due only to persons." 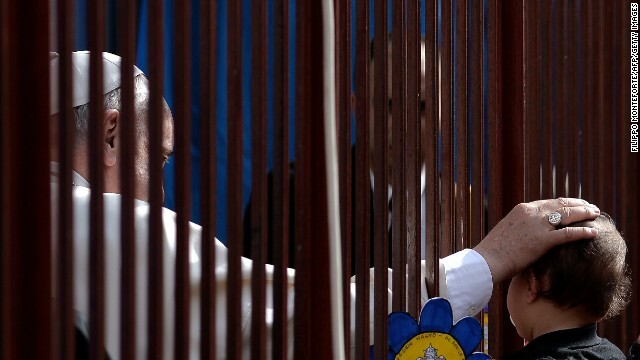 The quote that "paradise is open to all of God's creatures," which was mistakenly attributed to the current Pope, is now being attributed by the Times and others to a previous one, Paul VI, who died in 1978 -- although the attribution here is also not particularly decisive. Even if it were, just because a pope says something doesn't mean church teaching has changed. My apologies to all the animal rights activists, vegans and everyone who has ever lost a pet who got so excited yesterday. While Catholics believe that their leader is infallible, that doctrine is a lot more complicated than meaning that everything that comes out of the Pope's mouth is the gospel truth. Also, it's important to note that Paul VI's alleged comments apparently were in response to a young boy whose dog had recently died. In the Catholic Church, we call that being pastoral. In other words, the Pope was trying to comfort the boy and provide solace, not doctrinal instruction. What is true is that Francis has been vocal about the importance of caring for creation. The source of this whole controversy was a late November talk about how the End Times will result in a "new creation." But neither he nor Pope Paul VI went so far as to ascribe eternal souls to animals that would be comparable to humans. But, as this whole incident illustrates, people will believe what they want to believe.